The Golaem Attribute Spreadsheet is a floating tool showing an overview of the Golaem Attributes of selected /all entity. It can also set initial values on those items. The spreadsheet has two main tabs : one to display per-entity values, and one to display per-crowdField values. The spreadsheet allows to see, edit, and set/reset initial states on any Golaem attribute. The displayed attributes can be filtered by name (via the Attribute Name Filter), which can be case sensitive or not. They can also be displayed only for selected entity, or only for a given set of entityIds, of for the entities of a specific EntityType or CrowdField. If some attributes are not present on the entities currently displayed, they can be hidden via "hide Unused Attributes". Here some attributes are displayed as red : those have specific initial states, which have been set by editing the value, then right clicking on it and select "set initial states". Initial states can also be removed the same way : right click on a value, select "reset initial states". Setting an initial state on vector values includes all their 3 components. Beware that custom initial states from the spreadsheet, for each entity, can be costly, if set on a great number of entities (>1000). In that case, it is better to compute/set the initial values via an expression, in an attribute behavior for example. The CrowdFields Attributes are displayed on another tab, and can also display all, selected entity' crowdField or a specific CrowdField. 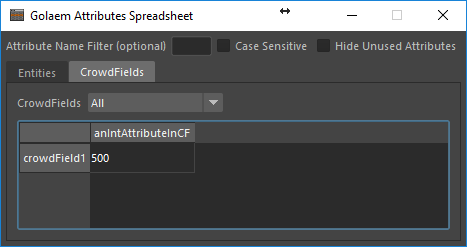 CrowdField attributes have no initial states context menu, as their initial value is already set when configuring the attribute.